Make the right predictions with BetVictor’s Golden Goal Offer and you could be pocketing a jaw-dropping £100,000! Pick a player. Pick a minute. Pick up £100,000. It’s that simple! Repeat these simple steps before every Sunday’s game in the Premier League and you could easily scoop the six-figure deal with the Golden Goal Offer! Win £100,000 by making two predictions: the player that will score the first goal of the match and the minute that goal will be scored in. The upcoming Sunday (October 23) will see Chelsea host Man United at Stamford Bridge, so you can select Wayne Rooney are your First Goal Scorer and you believe he’ll score sometime at the beginning of second half – 52nd minute. So place those two predictions and you’ll be on course to winning £100,000 with the Golden Goal Offer. But the best part about the Golden Goal Offer is that if no one wins the grand prize of £100,000 this Sunday, the amount will rollover and increase by £25,000 every week that doesn’t produce a winner. 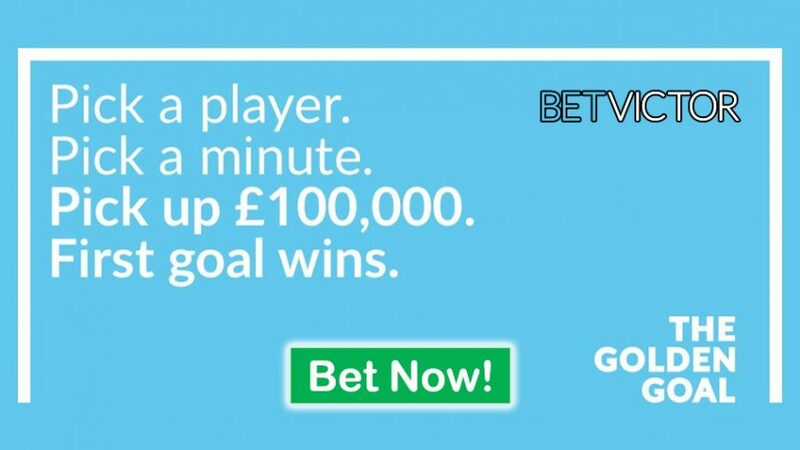 So you could be pocketing well over £100,000 at some point with BetVictor’s Golden Goal Offer. if there is no winner after the Chelsea v Man United Match this weekend, the prize will come back down to £25,000 and grow bigger onwards. Chelsea are the favourites 2.15 (8/7) heading into the clash on Sunday, while Jose Mourinho’s side are underdogs with odds of 3.70 (27/10). A draw between the two stands at 3.40 (12/5), but we’re leaning more towards a victory for the home side; they’ll enjoy home support which should aid their cause a great deal. All BetVictor customers have one Free Prediction every week, but if you’d like to palce more predictions you can do that by placuing additional bets with the online sportsbook or by playing games at BetVictor’s online casino. 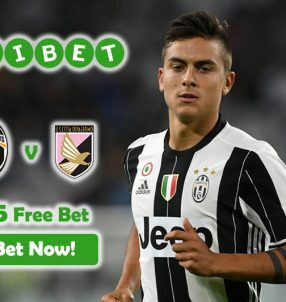 Wager £25 on any market to earn yourself a second prediction, while another £25 wager on any online casino game will grant you with the third prediction for the incredible Golden Goal Offer. This is not the first time BetVictor has dished out a massive bonus offer for football; previously players had a chance to get a piece of £1 million with the Million Pound Goal Offer during the Euros last summer. With this in mind, you can expect plenty more offers in the future that give out six-seven-figure rewards for special events. Pick your favourite player and the minute in which he’ll score the first goal to scoop £100,000 with the Golden Goal Offer! Get your hands on £100,000 with BetVictor’s Golden Goal Offer!